5TARDIUM will deliver an experience beyond what the audiences have ever imagined. They will become a part of the show as they stand completely surrounded by a spectacular pentagon stage and feel the music vibrate through their entire being. Stepping on the ground of 5TARDIUM, the audiences will enter into a new universe where the most magical and unforgettable experience awaits. 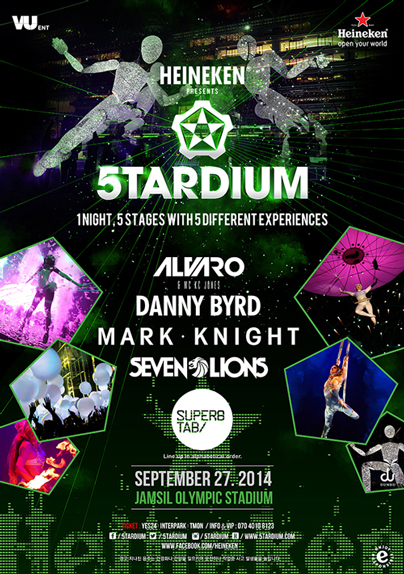 Experience the world’s state-of-the-art pentagon stage. Live performances of top international artists from uniquely different EDM genres. Get pumped for the most breathtaking performances by world-class DJs who will blow the crowd away. Imagine gigantic sparkling puppets DUNDU walking through the crowd, angelic heliosphere performer flying across the Seoul sky as the helium balloon floats in the air. Dreamlike laser shows and fireworks christening the night sky and more. Only at 5TARDIUM will your fantasies and desires come true. ‘5TARDIUM 2018’ is with Mercedes-Benz a global premium car brand. 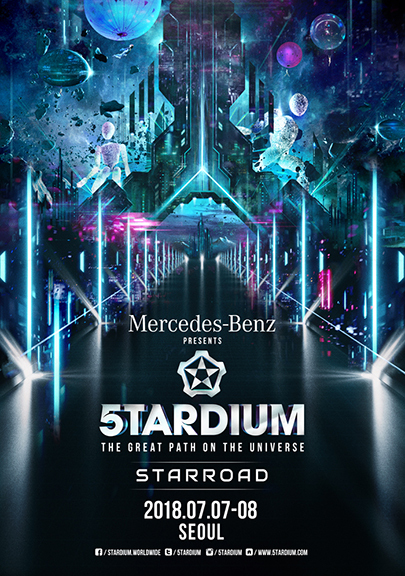 The conceptual EDM festival '5TARDIUM' announced the global premium car brand Mercedes-Benz Korean corporation ‘Mercedes-Benz Korea’ as a title sponsor. The ‘5TARDIUM 2018’, which celebrates its 5th anniversary, is preparing for a new leap with Mercedes-Benz Korea. 'VU ENT' was published in February 'Mercedes-Benz Korea' The sponsorship contract was signed with the title sponsor of '5TARDIUM 2018' and celebrated the 5th anniversary with 'Mercedes-Benz Korea'. Han Ik-soo, CEO of VU ENT, a licensee of '5TARDIUM 2018', said, ``This year, 5TARDIUM celebrates its 5th anniversary and sets a new slogan ‘THE GREAT PATH ON THE UNIVERSE’. ‘5TARDIUM’ will continue to work with Mercedes-Benz Korea to continue its legend of selling tickets for the past three years. And it will be placed as the best conceptual festival in Korea.” ‘5TARDIUM 2018‘ is preparing for fifth anniversary. ‘5tardium 2018’ will prepare for the first time in two days, for the 10 genre of artists. Moreover, it will show unique presence in the ‘5tardium’ with advanced performances and various experiences. ‘5TARDIUM 2018’ will be held at SEOUL in July. 'Heineken Stadium' 2017, which celebrated its 4th anniversary, showed that more than 90% of tickets are already sold before the lineup is announced. It means the concept, not the lineup, is enough to make the festival a success. The theme of ‘THE GRAND VOYAGE’ captures the audience with a variety of interactive elements that cannot be experienced in any festival. The enhanced DJ line-up also fulfilled the fans' expectations for the Heineken Stadium. DJs who have created their own unique style in EDM Scene around the world. Chris Lake, Nu: Tone, SPY, Alison Wonderland, and Dannic & Arty, representing five different EDM genres, have satisfied both audiences and critics. In particular, about 10 minutes between the day’s last performance, Heineken Moment maximized the impression of the spectators gathered on the spot with the laser which draws a huge green star on stage. 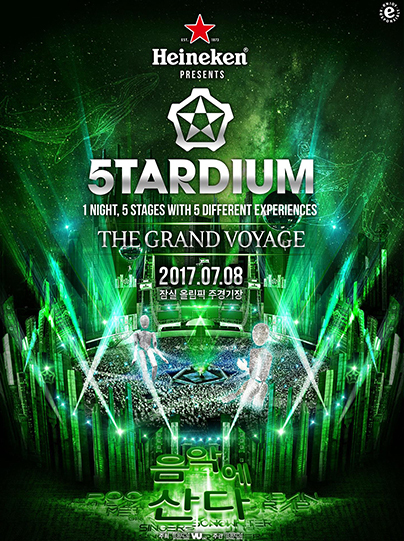 ‘Heineken Present 5TARDIUM’, which celebrated its third anniversary in 2016, presented fantastic experience to S.Korea’s EDM fans once again with the motto “Five amazing experiences in five stages”. Especially 2016’s theme ‘THE MYTHOLOGY’ provided the perfect stage and sound to meet the expectation of fans under more powerful and dreamlike theme ever. The Heineken Present 5TARDIUM, which made 25,000 audience enthusiastic previous year, had been rated as the world’s first five stage stages, with a huge pentagon shape and a special stage presentation surrounding the audience. Furthermore, the high-quality EDM sound introduced by DJs, representing the five different EDM genres, was evaluated as a festival that broadened domestic EDM awareness limited to club music. 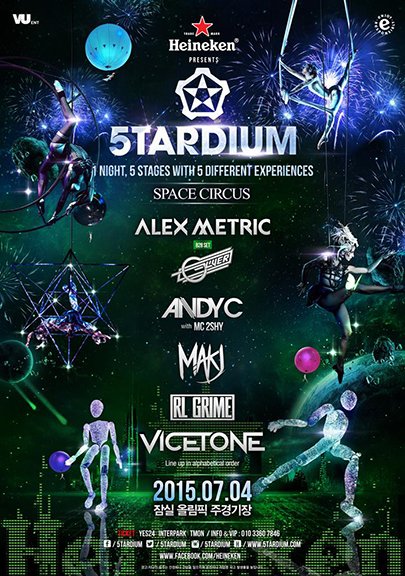 The 2015 Heineken presents 5tardium was held in Seoul Jamsil Sports Complex Main stadium on July 4th, with the theme of “Space Circus”. More than 25 thousand people attended and enjoyed the festival. Artists in 2015 were “Alex Metric & Oliver” with funky groove and never-stop rhythmic disco, “RL Grime” with the hottest EDM genre trap, “Andy C” with drum and base, “MAK J” with electro house, and DJ duo “VICETONE” with progressive house. After the exciting performance of “MAK J”, green laser beam shot from the 5 stages formed a gigantic star above the audience’s head followed by the massive fireworks for the finale. Audiences fascinated by the splendid performance and highly satisfied for the sense of unity with the event. 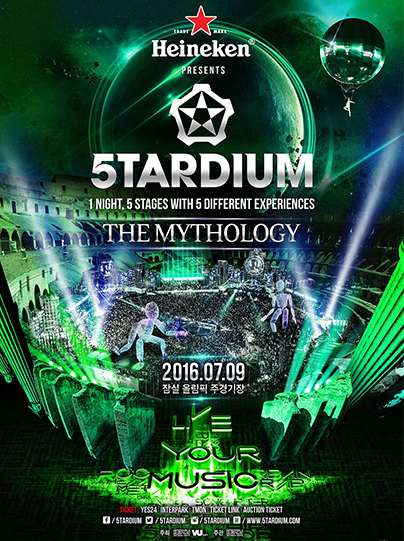 Heineken presents 5tardium is new concept of music event made by Heineken larger beer brand and production agency VU ENT with the idea of “offering audiences unique experience and intensive joy that people have never felt before.” Heineken present 5tardium held in Jamsil Sports Complex Main stadium on Sep. 27th 2014, made a world’s 1st attempt for special 5 staged with the shape of pentagon. Each stage in pentagon showed characteristic performance with 5 different genres, and stimulated the audience with the innovative technique, up-to-date lighting effect, fancy fireworks, etc. There were 5 global artists – “Alvaro” with electro house, “Danny Byrd” with Drum & Base mingled R&B, garage, Jungle sound, “Mark Knight” with techno house, “Seven Lions” with lyrical dubstep, and trans music duo “Super8 & Tab”. © 2014-2019 5TARDIUM. All Right Reserved.